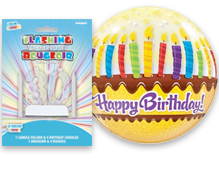 Birthday Decorations, Party Hats, Candles, & Other Party Supplies. If one’s determined enough to see it through, a party can be had just about anytime and anywhere. This can be seen as either exuberantly festive or highly inappropriate depending on point of view. That’s why most tend to specify a dedicated venue or locale to host the festivities and to help project the right mood and ambiance, party decorations are typically used to dress up the environment. 1SuperParty specializes in party goods, party decor, and other essential party stuff for celebrations, events, blowouts, and merrily mirthful meetups. Our warehouse is chock-full of discount party supplies, bulk party supplies, and wholesale party goods so that planning for any affair is as simple as (birthday) cake. Speaking of which, we’ve got birthday decorations such as party balloons, cake toppers, birthday candles and number candles for birthday cake, door posters and signs, party hats, plastic table skirts, and ornate paper lanterns, and other various scenic bits to bring out the party animal in every single one of your guests. Add even more pizzazz to your celebration with 1SuperParty’s huge selection of party decorations and accessories.